Hurray !! I have reached a milestone, this post is my 100th no. of post. While writing my first food post, I realized I was a bit late to this foodie blogger marathon. But as they say, better late than never, right ? I started food-blogging as a bit of hobby. I knew it was something I enjoyed doing, but had no idea how much it would take over my life. My blog is like my second baby, I am nurturing it and helping it grow every time. Hmmm.... I think this is a cause for celebration, so made an eggless black forest cake. 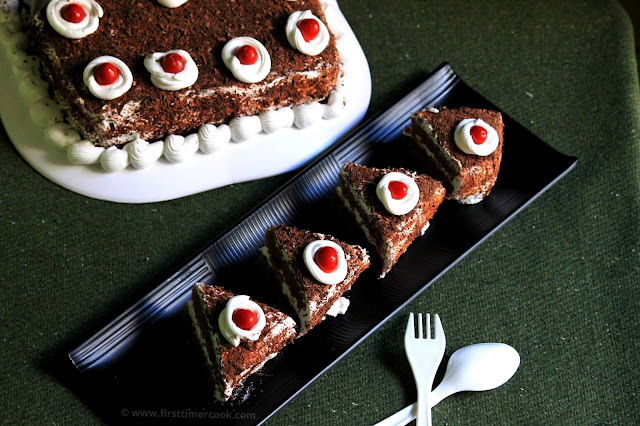 Eggless black forest cake is my most favorite cake. The cake is so soft and juicy. If you are planning to make this cake for any celebration, then it's better to make it on previous day, refrigerate over night and then use it for the best result. 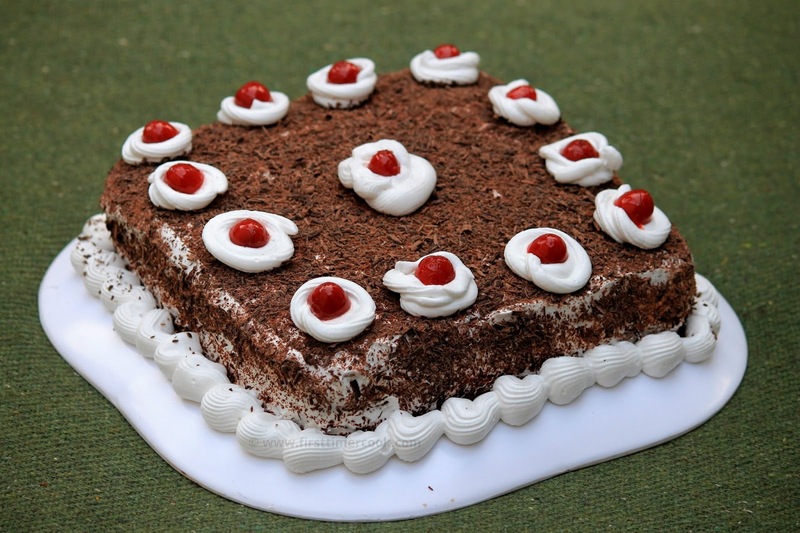 Black forest cake can be prepared with 2-3 layers of cake. I have just kept with two layers. 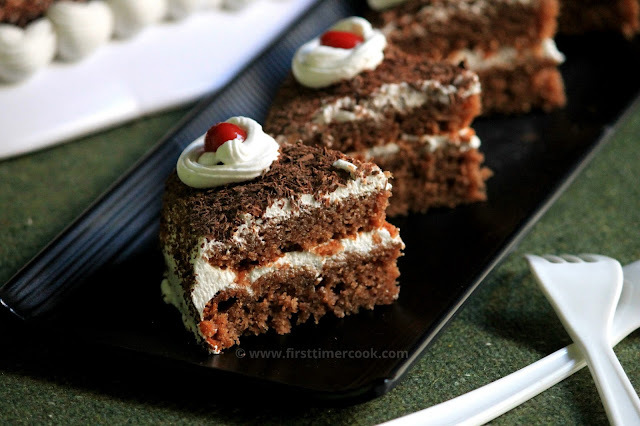 The base cake used here is purely eggless, butter free chocolate cake. The process is not difficult at all; but yes, the whole process takes a lot of time. This cake is perfect for celebrations. So thought of making and then share over here. Lets go in details step by step method of preparation. Preheat oven to 180 deg C. Lightly grease a cake tin (I have used a square cake tin) lined by butter paper with oil and keep aside. Sift all purpose flour, cocoa powder, salt, and baking soda in a bowl. Keep aside. Take sugar in another bowl. Add water, oil, vanilla essence and vinegar. Mix well. Next add the shifted dry ingredients into the wet ingredients. Just gently fold in, don't over mix. Immediately pour the batter into the greased cake tin and bake for 35-40 mins. Take out from oven and let the cake to cool down for 10 mins in the cake tin. Then invert and allow to cool down completely. Take water, sugar and cherries in a saucepan. Boil for a while till sugar syrup consistency reaches. Keep aside. Take heavy whipping cream in a bowl. Add powdered sugar and vanilla essence. Whisk using electric whisk for about 7-8 minutes in the highest speed or until stiff peaks arise. Don’t overdo the beating as the cream might turn into butter. Keep in refrigerator till needed. Scrape the dark chocolate using a peeler. Collect all the chocolate shavings and keep in refrigerator till needed. Now cut the cooled cake into two halves horizontally. Take a serving platter (must be bigger than the cake base), first place the top half of the cake in center of the platter. Brush the top of the cake with some cherry syrup. Make sure the cake should not be soggy. Take out the whipped cream from refrigerator. Then using a spatula, apply some whipped cream on top of the halved cake and spread evenly. Tear some cherries from the syrup and put over the whipped cream layer. Now place the other halved cake over the cherry layer. Repeat the same method of spreading syrup, whipped cream for this second cake. Next spread whipped cream covering all the sides and make it smooth. Keep in refrigerator for 5-10 minutes to set the cream a bit. After 5-10 minutes, take out from refrigerator. Apply the chocolate shavings on sides and top of the cake. Take a piping bag fitted with a medium star nozzle. Fill it with some whipped cream and decorate the cake top and sides as desire. Finally put some whole cherries on top. Cover the whole cake by putting a big bowl over it without touching the cake, refrigerate for at least 3-4 hours or overnight. 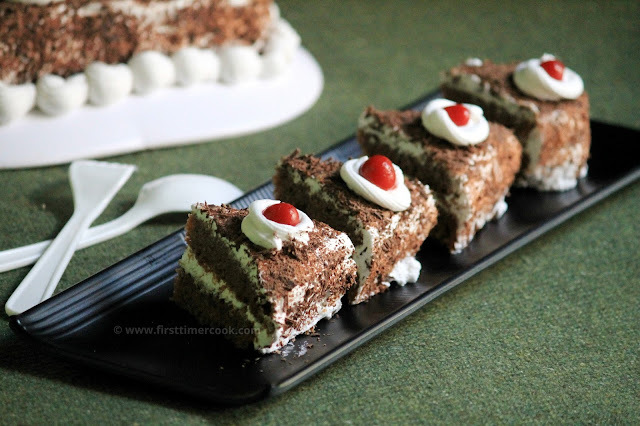 After 3-4 hours the frosting part has set well, then slice and serve this delicious eggless black forest cake ! If there is some left over whipped cream, then just store in an air tight container. They can stay fresh for 3-4 days in refrigerator. Instead of cherry syrup, normal sugar syrup can be used (skip the cherries while making cherry syrup). The cake may taste hard as soon as taken from refrigerator. So just keep the cake outside for 30 minutes before having it. Always keep the whipping cream in refrigerator till needed to maintain the peak in the cream.